When I arrived in China last week for a 5 day hectic visit, my computer died day 2!! after an initial panick attack, remembering that I had not backed up for about a year, it went off for a screen fix!..It returned the day I left for Fiji, but only lasted two days till Monday when the screen died again and after a little stress with no fix available in Fiji, we bought a new external screen to keep it alive while we backed up…BUT! !..then the brains started to spark and smoke..so yes we are in the middle of another panick attack!..Jane spent two days trying to save things..no luck yet…so today it is off to get a new computer and try a postmortum to get the data off??..AGGHH!! !…I now wish we used Kerosene lamps and posted letters!! After seriously smoking out the galley and delivering the best Steaks ICE have ever seen, John “Capt. America” has headed off diving in the Yasawas for five days to brush up on his SCUBA skill and will return on his 29th Birthday. 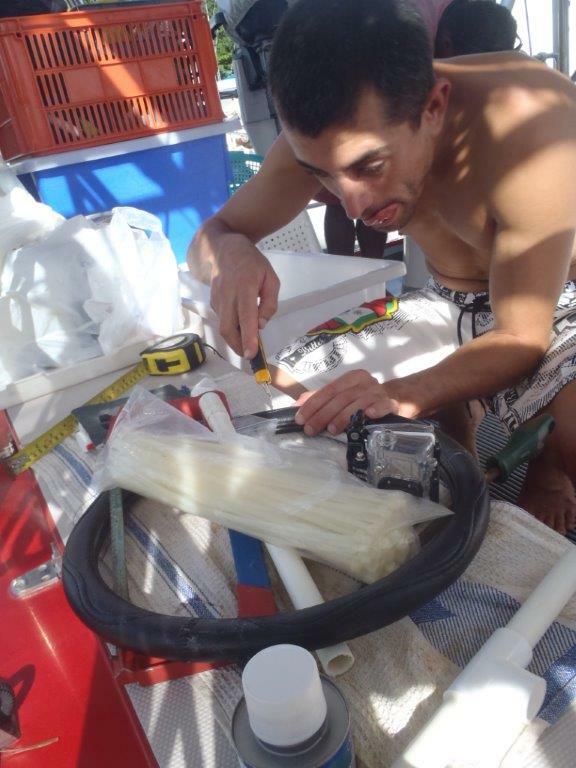 Gregory” “Peppe” has been building a GoPro camera (we have 4 onboard now!) mount out of water pipe. There are crew pictures on the “Crew” page of the web site now and profiles will go up when the crew write something about themselves..lol!! Mark Belvedere in Tonga rings every night. There are some amazing things happening there right now, so looking “very Interesting” The new 25ft “Fast Dive Boat” is about to start building in Nuku Alofa with KW International and should be in the water in a few months. My hard working friend in Tasmania Doug Campbell, who build my Bounty Boat, spent about a week finally sorting and shipping all our Australian equipment now headed for Melbourne, Auckland then Tonga..THANKS MATE!!!. Mean time, we are gearing up for the six shipments from all over the world that are about to arrive here in Fiji at the marina, not to mention the 48 jobs still on the work list for ICE!!…Busy!! …I need my Computer! !